Timothy C. Hain, MD, and Bulent Mamikoglu, M.D. Most recent update: November 6, 2016 . Many people complain that their ears itch. There is relatively little academic literature on the subject, and seemingly little interest by dermatologists to publish paper about this small pocket in the body. Here we will look at causes and treatment of dry and itchy ears. Ear canal skin is sensitive. The slightest accumulation of debris, even a hair clipping, may be felt as an itching sensation. Thus one cause of itching is loose skin or foreign bodies. These can usually be best handled by seeing a doctor who can clean the ear. We have seen interesting situations where insects found their way into the ear canal. This is fortunately very rare. These can usually be easily removed by the ear doctor after making sure they the organism is dead (usually by using alcohol). Small children are sometimes fascinated by the possibilities of putting small objects in their ears, such as beads, pebbles or small beans. These can be very troublesome, especially if a secondary infection occurs, and are best handled by an ear doctor (otologist), and not a family doctor or nurse practitioner. A normal ear has a thin layer of natural body oil. 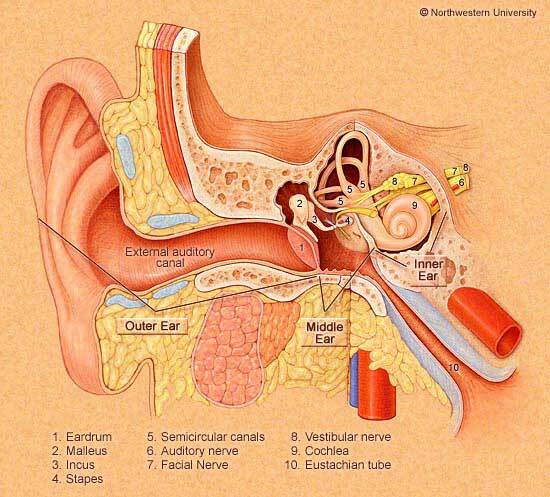 Some ears produce no ear wax which results in dry and itchy ear skin. Sometimes people compulsively clean their ears and dry them out by removing the natural wax. Dry ears tend to accumulate flakes of dry dead skin. For people who just lack ear wax, occasional insertion of a few drops of vegetable oil can be helpful. For people who compulsively clean out their ears, we advise scheduled appointments for ear cleaning, usually every 6 months, and avoidance of use of 'q' tips, or similar instruments in between. Sometimes the plastic of a hearing aid or polish on the surface of the plastic will cause an allergic reaction in the ears of the wearer. The polish can be removed or the hearing aid mold plastic changed. Hearing aids of the "BTE" type, where the main processor is behind the ear, have far less issues as there is very little contact between the hearing aid and the skin of the ear. This is not always possible however. Hearing aids may have a bump which puts pressure on the ear canal. This can be irritating and cause itching. The solution here is to have the hearing aid mold revised. Skin diseases such as allergic dermatitis, psoriasis, eczema, seborrheic dermatitis can cause itching in the ear just as they do elsewhere. These are treated in the same way that they are treated elsewhere in the body. Generally they are diagnosed by otoscopy (looking inside the ear). Steroid creams are used in persons with allergic skin diseases affecting the ear (see below). Like the skin in general, the skin of the ear can get an infection. The most common cause is "swimmer's ear", where generally speaking, bacteria start growing in an ear canal causing irritation and drainage. Occasionally ears can be infected with fungus (Jia et al, 2012; Abdelazeem et al, 2015). This usually results in a chronically irriated ear that appears infected but does not respond to ordinary antibiotics. The ear can also be infected with ear mites (Al-Arfaj et al, 2007; Cevik, 2014) a parasite similar to the dust mites that live in your pillow. Ear mites in particular, are common in cats, and are probably underdiagnosed in humans. Cevik (2014) found an ear mite (demodex) in about 6% of itchy ears. These mites are extremely common in humans-- some studies report them in 100% of adults. Blepharitis (inflammation of the eyelids can also be caused by these mites. Viral infections are rare -- the most common one is recurrent herpes zoster (i.e. chickenpox) where small blisters are seen in or on the ear. Swimmer's ear (external otitis) is discussed separately. Sometimes people get very nervous and start to scratch themselves. This can also occur in the ear. This is likely an amplification of normal sensation that the person would otherwise ignore. Yilmaz et al (2015) reported that 43% of patients with itching ears had a "Type D" personality, as compared to 15% of controls. Type D personality is a psychological term describing the "distressed" type of person who tends to have negative feelings and avoids social contact. We are a bit dubious about this -- we think itchy ears are mainly associated with skin disorders in the ear. General principles are to avoid aggressive cleaning and keep the ear dry. For the most part, as your ear canal is usually just a blind pocket of skin, you can treat it similarly to skin on other parts of your body. However, if there is a perforation of the ear drum, then it is generally best to avoid self-treating and see an ear doctor, because some preparations may damage the inner ear should they go through the perforation. Perforations are fortunately rare, and also generally easily detected because they can be seen by a general physician using an "otoscope", and because they often drain. Similar considerations apply to people with open mastoid cavities - -this is a type of surgery where a hole is left between the ear canal and a sinus. Although patients are often admonished not to stick things into their ear, especially sharp instruments such as bobby pins or pencils, many individuals use 'q' tips on a daily basis, and their health care provider may suggest that these preparations be administered by dipping the 'q' tip into them, and then gently applying them to the lateral walls of the ear canal. It is not a good idea to touch the ear drum with the 'q' tip however. Drying preparations such as alcohol, and irritating preparations such as hydrogen peroxide or vinegar (acetic acid) or boric acid are usually not very helpful for dry ears, but may be helpful for itchy ears , perhaps because they alter the baterial, fungal or other flora in the ear canal (see below). Dry ear: A few drops of a vegetable oil such as olive oil every day or two may help keep the ear from getting too dry and also protect it from water. You can use cooking oil (such as olive oil), or you can buy "ear oil", such as "Wally's Ear Oil". Another brand name for olive oil is "Sweet oil". We think just using olive oil as found in your kitchen is the more sensible option. Steroids creams or drops are sometimes used for itchy ears that are presumed to be non-infectious (e.g Babakurban et al, 2016) . The creams combine both an oily base as well as the steroid that reduces inflammation. Some of these are available over the counter, and some require prescriptions (such as triamcinolone cream (Kenalog)). Steroids have the potential to make infectious causes of itching worsen as they reduce one's defenses to infection, particularly fungus. Overly frequent use (i.e. daily), can make the skin more fragile. Some have proposed using steroid nasal sprays to treat allergic ears (Bernstein, 2012). We don't see any advantage to this over using creams. Dermotic oil is a steroid containing oil -- having fluocinolone as the active ingrediant. It is typically used as drops in the affected ear, once or twice a day, for one to two weeks. It is not intended for permanent use. If an itchy ear does not respond to this powerful treatment for inflammation, one should be thinking that it might be infectious. Many hand sanitizers contain ethylene alcohol. An old remedy for itching is to apply hand sanitizer to the itchy ear canal with your finger tips or with q-tips. After few minutes of application of the alcohol the C fibers will be occupied and will not transfer the itching sensation. As alcohol kills most bacteria and fungi, this is also a method of treating some infections. Of course, this remedy should not be used in an ear with a perforation in the ear drum or with an open mastoid cavity. Castellani's paint is available over the counter, sold as a "first aid antiseptic". It would seem certain that should this preparation enter the middle ear through a perforation, inner ear damage would result. It should be safe, however, when applied in the ear doctor's office using a microscope, even if there is a perforation. A similar preparation to the non-modified Castellani's paint is Gentian violet. This is used specifically for fungal infections in the doctor's office. Gentian violet stains skin, and when used in open wounds, can cause tatooing. Abdelazeem, M., et al. (2015). "Epidemiology, causative agents, and risk factors affecting human otomycosis infections." Turk J Med Sci 45(4): 820-826. Abou-Halawa, A. S., et al. (2012). "Otomycosis with Perforated Tympanic Membrane: Self medication with Topical Antifungal Solution versus Medicated Ear Wick." Int J Health Sci (Qassim) 6(1): 73-77. Bernstein, D. I., et al. (2012). "Effects of intranasal mometasone furoate on itchy ear and palate in patients with seasonal allergic rhinitis." Ann Allergy Asthma Immunol 108(5): 359-362. Al-Arfaj, A. M., et al. (2007). "A human case of otoacariasis involving a histiostomatid mite (Acari: Histiostomatidae)." Am J Trop Med Hyg 76(5): 967-971. Babakurban ST, Topal O, Aydin E, Hizal E, Copur S, Ekici MD.J Laryngol Otol. 2016 Oct;130(10):934-938Therapeutic effect of Castellani's paint in patients with an itchy ear canal. Cevik, C., et al. (2014). "Investigation of demodex species frequency in patients with a persistent itchy ear canal treated with a local steroid." J Laryngol Otol 128(8): 698-701. Jia, X., et al. (2012). "Otomycosis in Shanghai: aetiology, clinical features and therapy." Mycoses 55(5): 404-409. Yilmaz B, Canan F, Şengül E, Özkurt FE, Tuna SF, Yildirim H. Type D personality, anxiety, depression and personality traits in patients with isolated itching of the external auditory canal. J Laryngol Otol. 2015 Nov 26:1-6.